As a Canadian, I feel my need to apologize to NASCAR for turning my attention away from the 400 mile race Shelby American at Las Vegas Motor Speedway as I just had to watch the Olympic Men's Hockey finals between Canada and the United States. Judging published accounts of Sunday afternoon's TV Ratings in Canada and the United States, it's fair to say I was not the only one who watched the brilliant 3-2 victory of Team Canada's male athletes in a hard-fought effort through overtime. Through all the excitement and the sheer volume of the major hockey event, I have to candidly admit that the feeling of watching the NASCAR Sprint Cup race at Las Vegas Motor Speedway was comparably underwhelming on this afternoon. Started under a bright sky in front of a reportedly sell-out audience at the 1.5 oval, the Las Vegas native Kurt Busch pole position gave him and his #2 Miller Lite Dodge lane choice for the Shelby American start. Choosing the top side, Busch's decision immediately turned out to be an unwise decision following the drop of the green flag. Holding the lower line, fellow front row starter Jeff Gordon motored his #24 Chevrolet around the #2 Dodge to take the lead. Setting the course of the day, Jeff Gordon would lead often through the 400 mile event. Gordon led for the first 52 laps until Roush Racing's Greg Biffle was able to sneak by the Hendrick Motorsports #24 car on a restart from a caution. As Biffle claimed the top spot, the green flag period was very short-lived. In fact, according to the track alert lights, the field was still under yellow flag conditions. Wisely acting on the side of driver safety, a yellow flag was thrown by NASCAR so they could correct the signaling error. Taking only 3 laps under caution until the race could be restarted, this signaling problem would creep once more on lap 109 when the issue was fully remedied. With 7 caution periods overall in the 2010 NASCAR Sprint Cup race in Las Vegas, the incidents are fairly tame for the most part. However, a caution drawn on lap 94 would reflect the only multi-car accident in the race involving three cars which have shown competitiveness through the early stage of the 2010 Sprint Cup season. 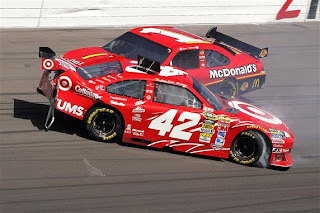 Creating the 5th caution of the Shelby American race, the Earnhardt/Ganassi Racing #1 Chevrolet of Jamie McMurray slipped up into his teammate, the #42 of Juan Pablo Montoya through turn 4 on the racetrack cited earlier in the race as being slick. Spinning out Montoya, the red #42 car ran up the track striking the turn 4 wall enough to infect serious damage to the car's deck lid area. As Kurt Busch came through the turn 4 area, he became the only non EGR casualty of the situation as he made contact that damaged the right front corner of his blue Dodge. McMurray was apologetic in the aftermath of the accident taking responsibility for the costly day for Earnhardt/Ganassi Racing. All three cars suffered damage requiring extended attention of their crews but finished the event only at most 20 laps down. The Hendrick Motorsports duo of Jeff Gordon and Jimmie Johnson led all but 30 of the 267 laps of the Shelby American at Las Vegas Motor Speedway. Little else happened through the race as only Matt Kenseth, Tony Stewart, and the odd appearance of Scott Speed were some drivers who mixed up the complexion at the front of Las Vegas Motor Speedway when the Hendrick Chevrolet were pitting or were bypassed on pit strategy. The other Hendrick Motorsport cars were having mixed days in the NASCAR Sprint Cup Shelby American as Mark Martin was able to hold on to the top 10 while Dale Earnhardt Jr fell from a 4th place starting spot to the lower part of the top 15 after 200 laps. Being a match race between Gordon and Johnson at the end, Johnson who was running 2nd place since the mid-way point of the race out-powered his teammate and part-owner on lap 251. In the final run, Jeff Gordon's #24 Chevrolet also gave way to the #29 Chevrolet of Kevin Harvick (who fought his way from a 34th place start) relinquishing the runner-up to the Pennzoil car. With considerable distance to Johnson, Harvick ran out of laps to catch Jimmie Johnson for the second straight week. Again, Jimmie Johnson's #48 Lowes Chevrolet from Hendrick Motorsports successfully streaked claim to a 2010 NASCAR Sprint Cup race trophy. Requiring a methodical climb from 20th place at the beginning of the event, Johnson wins his 49 career event in the major stock car racing series. Behind Johnson, Harvick and Gordon was the #5 Hendrick car of Mark Martin followed by the Roush Racing's #17 of Matt Kenseth. Finishing 5th, Kenseth is effectively gelling with his new crew chief Todd Parrott working in their second race together in 2010. After 3 races in the 2010 NASCAR Sprint Cup series season, Kevin Harvick continues to hold the lead in the early going. Last week at Auto Club Speedway, Harvick chuckled in response to the significance of leading this still infant season an told about his lead. Holding a 47 markers ahead of teammate Clint Bowyer, the #29 car's 32 position improvement in the Shelby American 400 miles race and win in Saturday's NASCAR Nationwide series round should at least keep a smile on the driver's face. A beneficial event to Hendrick Motorsports two lead teams, Johnson leapfrogs 7 positions to 5th but Jeff Gordon also surged by 9 spots in the overall points standing.